An important principle of American democracy is that the free exchange of ideas is crucial to social progress. We accept that protected speech can be often be ugly, provoke social unrest and include acts of civil disobedience. Yet, as far as possible, we must ensure that people are free to express their ideas – this cannot happen when individuals on one side of the debate are harassed and threatened. We’ve seen this happen in the abortion debate. Now, we see it unfold in the animal rights debate. Organized harassment, intimidation, threats and firebombs directed at individuals involved in biomedical research involving animals, as well as other animal-related industries, and their families, are neither uncommon, nor are they protected forms of free speech. 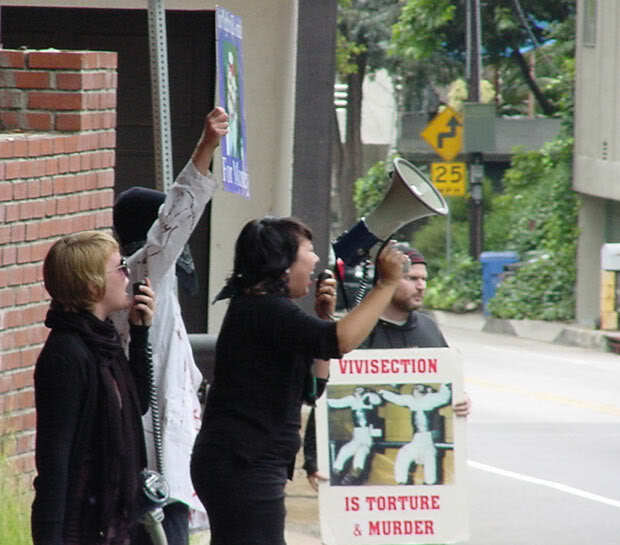 While these are the tactics are used by a relatively small group of animal rights extremists who work under the motto — “animal liberation by all means necessary”, the escalation of violence from radical elements of the movement has been fueled in recent years by a larger group of activists who sit by the sidelines celebrating these criminal acts and inciting individuals to more violence. There is an even larger majority which appears at least to silently approve. Only a disappointingly tiny group of animal rights philosophers and organizations have been vocal in condemning the violence from the fringes of the animal rights movement. Some of the activists have taken to the internet in order to publish the addresses of their “targets” along with carefully worded incitements to violence; others have initiated campaigns of hate against their victims; yet others have shown up outside the targets’ front doors at night, wearing ski-masks, and frightening children inside with chants like “we know where you sleep”. This is, in good part, the free speech so many activists want to defend. The behavior of animal rights extremists parallels that of radical, anti-abortion groups that targeted physicians who provided abortions to women who needed or requested them. To seek a remedy to the escalating violence from these groups, President Bill Clinton passed the Freedom of Access to Clinic Entrances Act, that prohibits trespassing, vandalism, threats of violence, stalking, arson and bombings directed at reproductive health care clinics or their personnel. The Animal Enterprise Terrorism Act simply attempts to control the criminal acts of animal rights extremists in a similar fashion. The Animal Enterprise Terrorism Act (AETA) contains a clause indicating that nothing within it should be construed to “prohibit any expressive conduct (including peaceful picketing or other peaceful demonstration) protected from legal prohibition by the First Amendment to the Constitution.” It is clear that only illegal conduct that is not covered under the First Amendment can be construed as violating the Act. Animal activists and advocates willing to express their views and educate the public regarding them can do so freely. It is those that support campaigns of intimidation, threats and hatred that want to challenge it. It is those that want to use their speech to frighten and torment into submission others that dislike the enhanced punishments. It is those that want to enforce their views on society by force (which defines terrorism) that want it struck down. We applaud Senator Feinstein for her stance in supporting legislation whose only goal is to respond to terrorist activities of a few and allow the rest of society to hold a civil debate on these the moral relationship between humans and non-human animals. Posted on February 8, 2012 February 8, 2012 by David JentschPosted in Animal Rights News, NewsTagged AETA, animal enterprise terrorism act, animal rights extremism, animal rights terrorism, demonstration, Dianne Feinstein, extremism, first amendment, protest. It is great to see the three mentioned in this article receive this well-deserved support and recognition! Indeed. When a mob shows up wearing ski masks in front of your home at night there is no legitimate public to address or educate about their social goals. Their goal is clear and simple — to harass, intimidate and threaten others to comply with their views. Such activities should not be tolerated. Well said, those who abuse the right to free speech need to be shown that their activities will not be tolerated. One excuse for the protests outside the family homes of scientists I’ve often read is that the activists “exposing the truth and share it with the friends, neighbors, colleagues and family of vivisectors”. The irony is that such demonstreations most often lead great sympathy on the part of friends, neighbors, family and colleagues for those targeted by extremists, and as you reported last year this sympathy sometimes evem leads to visible solidarity against the extremists. Lets not kid ourselves, home demonstrations are all about harassment and intimidation, and have nothing to do with informing or persuading, that was why they were banned by the UK government a few years ago…a ban that was welcomed by the overwhelming majority of people there.